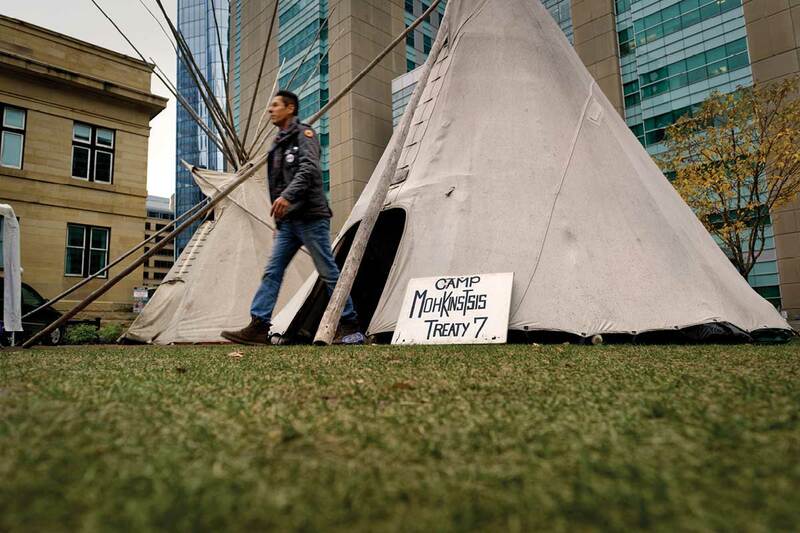 The growth of the protest camp set up across from the courts centre into a healing camp focused on truth, reconciliation and outreach echoes the evolving thinking of the man who says he’s not its leader. But despite what he may say, Garret Smith is building a movement for change and opening doors for conversation. Occupying a full city block downtown, Harley Hotchkiss Gardens — part plaza, part urban park — provides a bit of breathing space in the midst of downtown Calgary’s corporate jungle. On the west end of this block named for a dead oilman-philanthropist, directly across Fifth Street S.W. from the high-rise Calgary Courts Centre and dwarfed on all sides by shimmering skyscrapers, stand the tent and two teepees of the Mohkinstsis Healing Camp. On a warm evening in May, people begin to arrive at the camp for a community meeting. Garret Smith, the camp’s founder, greets them warmly, some by name. Folding chairs are pulled out of the teepees and the group of a dozen or so gathers in a circle. The word Mohkinstsis (MOH-kin-stiss) is the Blackfoot name for Calgary. The word translates to “elbow,” in reference to the Elbow River. The camp has evolved since its beginnings in the cold of February 2018: no longer a defiant protest, it’s now a place of healing and cultural outreach. This meeting, which Smith put out the call for in a Facebook post without specifying why, is about what the next steps of that evolution should look like. He tells the crowd that there have been conversations with Fort Calgary about moving the camp to a permanent location there. The reaction is mixed. People are surprised by the suggestion of moving the camp at all. Others are wary of Fort Calgary’s intentions. The notion of joining up with an organization devoted to settler history seems grating to some. Someone suggests if the move does happen, they should change the name of Fort Calgary to Mohkinstsis and make the fort a subsidiary of the Indigenous camp, which gets some laughs. The conversation gives way to the bigger question about the future. “We don’t have a mandate for this camp yet,” says Smith. “We don’t know what we’re doing.” As he often does, Smith emphasizes that he is not the boss of the camp, but its “spokesman,” and whatever happens must have the broad support of the Mohkinstsis community. There’s a general concern that the camp would lose something by abandoning the courthouse park for a more officially sanctioned space. The camp began, after all, without permission, a protest against the system, as a public, visible, unignorable statement: We are still here. What is now the Mohkinstsis Healing Camp sprang up in February 2018, but the sense of injustice that catalyzed it goes back centuries. But let’s begin with Smith’s story and how he came to set up a tent across from the Calgary courthouse in the middle of winter. 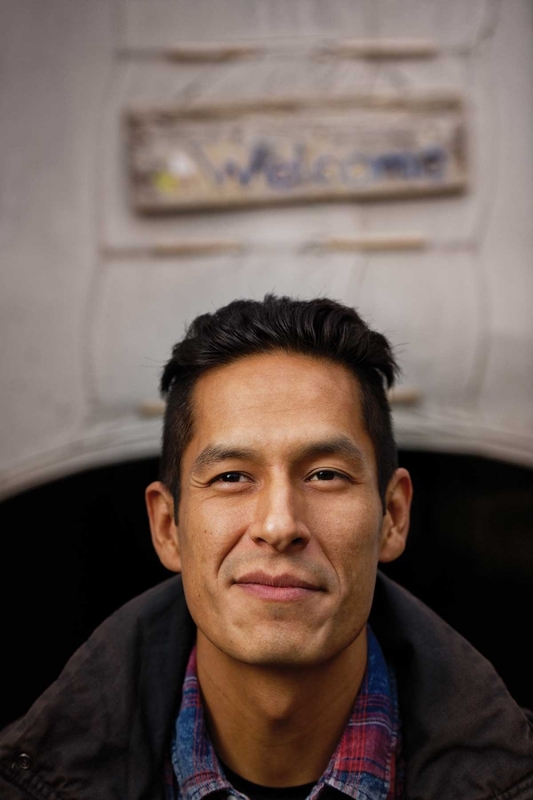 Born in 1984 to teenage parents, Smith was adopted by his grandparents and grew up on the Kainai and Piikani reserves in Southern Alberta, attending school in Pincher Creek. He recalls his childhood being one of constant road trips with his grandmother (her name translates to “Travelling Woman”) to visit family. He loved these trips, but as he got older, he came to value even more the home she provided him. He was a good kid with a talent for football who mostly stayed out of trouble. At 19, he had a daughter with his girlfriend, went to trades college and got a job welding to support his family. Smith’s life took a serious detour in 2006. One day, he went to cash a paycheque at Green’s Pop Shop, a general store that he calls a Lethbridge “community entity.” When the clerk pulled out a brown paper bag to retrieve the cash, Smith noticed stacks of $100 and $50 bills inside. He told friends and they joked about it: “Let’s rob Green’s — it’d be easy!” A few months later though, it was no joke. Behind on rent and facing the extra expenses that Christmas brings, Smith walked into the store on December 10 with a pistol and left with $1,920. Three days later, police came to his home, and he immediately confessed. Smith was sentenced to two years in 2007, and served nine months at the Drumheller Institution. His sister and his common-law partner each received a year’s probation as accomplices. The years following his release in October 2007 were turbulent. After four months in a halfway house, he got a construction job. It didn’t last. Neither did his relationship: he split with his common-law wife two years later. Smith began studying kinesiology at the University of Lethbridge, hoping to be a trainer for a sports team, but he felt out of place in the campus culture. A cousin who worked at the university signed Smith up for summer workshops in Indigenous theatre. 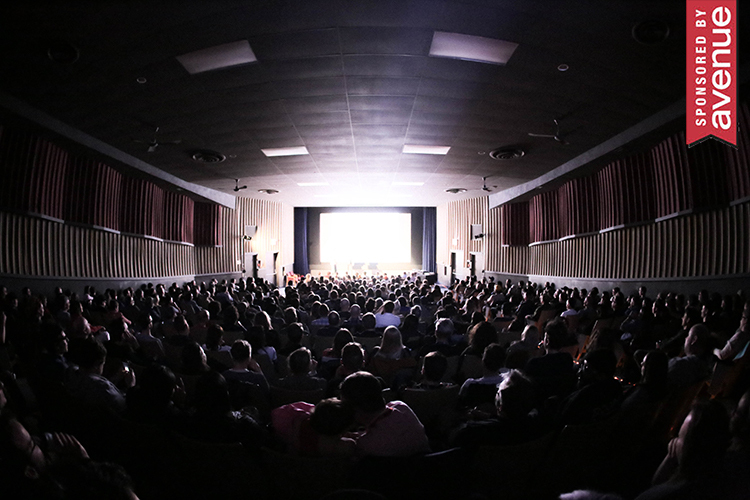 Smith loved it, and soon the Centre for Indigenous Theatre, a Toronto-based organization that ran the workshops, offered him a scholarship, complete with living and travel expenses. He spent the following nine years studying theatre and acting in Toronto, a positive time both personally and professionally. He returned to Calgary in March 2017 to work on We Are All Treaty People, a children’s theatre show. It was supposed to be a temporary move for work. But work begat more work, and Smith was still here when the accused killers of Colten Boushie and Tina Fontaine were acquitted. The deaths of Fontaine and Boushie were unnecessary tragedies. Many people, Indigenous and not, saw the acquittals of the accused not as one-off glitches, but as emblematic of the entrenched barriers in the justice system and in broader Canadian society that dehumanize Indigenous people, even in death. Gerald Stanley was acquitted of second-degree murder in the death of Boushie on February 9, 2018, despite admitting that the shot to the head that killed Boushie came from the gun Stanley was holding. Less than two weeks later, on February 22, Raymond Cormier was acquitted of second-degree murder in the death of Fontaine, a 15-year-old girl. The result was a one-two punch to Indigenous trust in the justice system’s ability to protect them, and the national conversation that followed revealed ugly, festering wounds of racism and resentment. It was unambiguously a protest camp in the mould of others that had appeared around the same time in Regina, Toronto, Winnipeg and elsewhere. Hand-painted protest signs adorned the site. About a week later, Contois took down her camp and Smith followed suit in solidarity. But he was immediately inundated with messages from the camp’s supporters, asking what had happened to it. The enthusiasm convinced Smith to re-erect the camp on March 11, name it Mohkinstsis, and turn the focus away from overt protest toward the idea of reconciliation and dialogue. Championing community building, Smith often says he is not the boss of Mohkinstsis, but more of a manager or public face. Whatever the title, he is perfectly suited for the role. Tall and handsome with an easy smile and friendly nature, he is approachable and disarming. Smith is fond of saying “The biggest mistake the colonizers made was teaching us their language,” and he embodies that idea. Articulate, thoughtful, intelligent and well-informed, with an actor’s comfort in front of an audience, he is a natural spokesman, not only for the camp but also the broader idea of reconciliation — a nebulous concept many in Canada remain hostile to. At its most elemental, reconciliation demands that Canada face the fact that its relationship with the Indigenous people it displaced has always been, and continues to be, in a word, unjust. In more words: racist, exploitative, repressive, duplicitous, even genocidal. These are strong terms, but history not only backs them up, it demands them. The Truth and Reconciliation Commission (TRC) was established in 2008 as part of the federal government’s settlement for the injustices done during the more than 100 years the residential school system operated — the largest class-action settlement in Canadian history. Created to document the history and repercussions of the residential school system, the TRC laid out 94 “calls to action” in 2015. They are not intended to be a list to be checked off, but reasonable first steps toward justice for past wrongs and building trust for future rapprochement between Canada and Indigenous peoples. Despite campaign rhetoric and promises, public apologies and hearings by the TRC, the fundamental imbalance remains. In the years since the TRC published the calls to action, few have been implemented and little has changed. Perhaps more than anything, this was the feeling that washed over many people after the acquittals in the Fontaine and Boushie cases; 21st century Canada may have a gender-balanced federal cabinet, but a white man can still kill an Indian and get away with it. There is ample statistical evidence of systemic racism against Indigenous people in Canada: they make up less than five per cent of the overall population, but more than half of foster children and nearly a third of prisoners; higher incarceration rates than blacks in apartheid-era South Africa. But these stark numbers are often dismissed as self-inflicted. Few of us are unfamiliar with this line of argument: If they were better parents, their kids wouldn’t get taken away. If they didn’t commit crimes, they wouldn’t get locked up. If they want better lives, maybe they should sober up. Canadians remain broadly unaware of the well-documented history and legacy of our colonialism. Few know that Canadian authorities relied on deliberate starvation to force First Nations to accept the terms of treaties, for example. Our elected officials established not only the explicitly racist residential school system, but also the Sixties Scoop (in which provincial governments separated First Nations families to place children with whites), and many other state policies and programs to intentionally destroy the family and community structures of Indigenous populations in a wider attempt to eradicate their cultures. Pointing out these policies is not a radical political argument; it’s simply a statement of the facts about what happened, although we have not talked about it or taught it in our schools. But by substituting the myth of personal responsibility for the truth of a history of racist policy, and squinting a little bit, it is indeed possible to dismiss reconciliation as a farce and the issues facing Indigenous peoples as problems of their own making. This is not a story about me, but my lens as a reporter bears acknowledging. 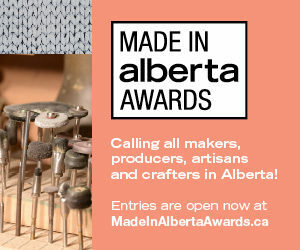 I am a white man in his early thirties from a middle-class background who grew up largely in the suburbs of Calgary. I completed public school in 2003, but the term “residential schools” didn’t enter my consciousness until the government apologized for the program in 2008. The idea that my benign, friendly Canada was a settler nation with a terrible, unspoken past only took shape in me later, once I began studying history. That history fundamentally changed my view of modern Canada and my place in it. I live downtown, just two blocks from the Mohkinstsis Healing Camp. Smith and the community he catalyzed are quite literally my neighbours — the Fifth Street cycle track, which I ride daily, passes both my apartment block and the camp. One day last spring, before I had visited Mohkinstsis, I paused in a Plus-15 walkway above Fifth Street to look at the teepees. Two men about my age in business clothes — one white, one brown — also stopped when the camp caught their eye. The men commented profanely on the absurdity of the camp and the entitlement of “the Natives.” They evidently did not know anything about the camp, but they nevertheless resented its existence. Systemic barriers to reconciliation remain, from the Indian Act and reservation system to fundamental problems within institutions like the police and justice system. But changing those is only one part of the process. Smith’s focus is on reconciling on an individual level within our communities, building bridges and dispeling myths and prejudices to understand our neighbours. Though he believes in the power of protest, Smith thinks a different approach will better serve his aim of dialogue connections across the settler-Indigenous divide. Mohkinstsis is intended to be an open space where anyone is welcome, as well as to provide a safe and visible home for Indigenous culture in the city. Calgary’s comparatively small Indigenous population makes it something of an anomaly among major prairie cities. In the 2016 census, 41,645 people identified as Aboriginal, just three per cent of a city of 1.3 million. In terms of Indigenous representation, that puts Calgary more in line with Vancouver (2.4 per cent) than prairie centres like Winnipeg (12.2 per cent), Regina (9.9 per cent) or Edmonton (5.9 per cent). Though Smith says he wasn’t initially sure what purpose the camp would serve, it clearly fills a need for many people — primarily First Nations and Metis, but also non-Indigenous allies. Everyone is welcome. A community organically sprang up around Mohkinstsis from the beginning; strangers offered material support, donating everything from chairs to drinking water, firewood to moose meat. Even the teepees themselves are on loan for no charge from supporters. Smith says a provincial judge crossed the street from the courthouse to offer the use of his office shower. But the camp has attracted more than just gifts. It draws people in, whether out of a sense of belonging, a desire to contribute, or simple curiosity. A handful of individuals began coming regularly, spending time at the camp and tending to its needs. Cinnamon lives in Cochrane but often comes into the city to visit the camp, bringing truckloads of firewood and supplies, and one of the teepees is hers. Sometimes she just spends time talking with strangers and regulars about Indigenous culture and issues. “What blows my mind is we don’t even know each other,” says Smith. “[Deborah] went out of her way.” He gestures to the tent, cabana, picnic table and teepees that surround him and tells me, “None of this is mine.” It’s an effort at modesty, intended to emphasize that he is not the proprietor, that this is a collective effort. But there’s more than a hint of incredulity in his voice, a sense of marvel at the generosity of strangers determined to support the endeavour he began. Even those who visit the camp infrequently contribute to it. Homeless people, especially those of Indigenous heritage, often come with respect and reverence, asking how they can help. Smith asks them to do what they can: pick up cigarette butts, take away garbage, keep watch at night. On occasion, Smith says, they have come with traditional offerings of tobacco. Like Smith, they are detached from their culture and unfamiliar with the traditions, yet they see value in the camp. These interactions provided the inspiration for perhaps the most ambitious of Smith’s plans for the future of Mohkinstsis — an initiative for the homeless. Smith says he’s heard from many people that the existing network of shelters aren’t serving their needs, whether due to overcrowding or the detrimental culture within those spaces. 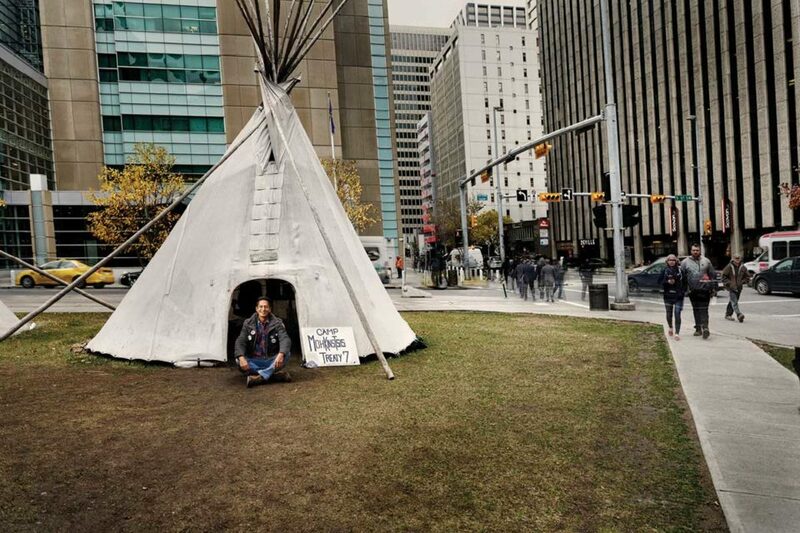 His vision is to have a couple teepees providing a safe space for homeless Calgarians (Indigenous or not) to sleep, along with a support structure and traditional healing practices in a First Nations context. The set-up wouldn’t be for everyone — those under the influence, for example, would not be welcome — but it could provide an alternative to the existing shelter system, Smith thinks. Eventually Smith wants to expand Mohkinstsis to multiple locations in the city while retaining a permanent presence across from the courthouse to serve as “an Indigenous chapel” for people struggling with the justice system. He also has a podcast underway that will discuss political and cultural issues with Elders and thinkers, all part of his goal of raising awareness and encouraging dialogue. The reason, a spokesman for CPS said, was that they had already established a relationship with Mohkinstsis, and “the main concerns around the camp related to things that fall under police jurisdiction.” The police stressed that the camp was not breaking any laws and had obtained permission from the provincial government to stay there. CPS declined an interview request and further comment. Fort Calgary wouldn’t comment beyond acknowledging that there had been a conversation initiated by CPS about collaboration but that that conversation had ended. None of these institutions seemed to want to say much at all about the camp, as though it were a controversial subject. Perhaps it is. Despite its prominance, longevity and commitment to reconciling communities, as of October 2018 no municipal politician had visited or made public comments about the camp. Smith doesn’t care. He’s not looking for attention, though he’s grateful for the handful of local media stories about the camp. Smith’s ambitions for Mohkinstsis have grown as community support for it has entrenched. But the camp has another, more personal goal for Smith. He has long felt ignorant about his own cultural traditions. He speaks only a little Blackfoot and only vaguely knows customs and protocols. The camp arose from a place of anger and evolved to serve understanding and reconnection, reflecting his own growth and desire to get in touch with his heritage.